Summit Natural Gas of Maine and Maine Natural Gas pln to submit bids again in response to the state's recently issued new request for proposals to bring gas to state property in central Maine. AUGUSTA — Two companies that battled for the state’s natural gas business last year plan to submit bids again in response to the state’s recently issued new request for proposals to bring gas to state property in central Maine. Officials from both Summit Natural Gas of Maine and Maine Natural Gas said today their firms will submit bids in response to the state’s request to connect up to 30 state property to natural gas. Summit and Maine Natural Gas were the finalists the last time the state sought firms to bring natural gas to the area, a process that started in 2011 and ended last year after state officials acknowledged the state’s bid evaluation process was flawed, and rejected all bids. Maine Natural Gas, whose bid the state selected initially, sued after the bids were rejected. That lawsuit was dismissed in March. With the renewed effort, the state expects to save millions by converting to natural gas heat, in some cases as soon as Nov. 1. But its recently issued request for proposals for firms to connect 30 state buildings and other property in Augusta, Hallowell, Waterville and Vassalboro to natural gas doesn’t contain language requiring or even encouraging bidders to also bring natural gas to homes and businesses in the region, as the previous state request for proposals did. At least in part, state officials said, that’s because it is already happening on its own, anyway. At least two companies are already working to bring natural gas to businesses, residents and other users in the area already. That’s especially true in Augusta, where Maine Natural Gas and Summit Natural Gas of Maine are competing for customers and working rapidly on their pipelines, some of which run down the same streets as their competitor, and go right past some of the state facilities that now seek gas service. Patrick Woodcock, the governor’s energy director, said that should allow the state to convert to gas and begin saving money soon. David Heidrich, a spokesman for the state Department of Administrative and Financial Services, said the state’s request for proposals didn’t emphasize a desire for bidders to also expand their natural gas pipelines to serve other users in the area in addition to state government, because it didn’t need to. Though he said the state using natural gas could help encourage expansion of gas. Officials from both Maine Natural Gas, a subsidiary of Iberdrola USA, which also owns Central Maine Power, and Summit Natural Gas of Maine, a subsidiary of Colorado-based Summit Utilities, said today they will submit proposals to provide a natural gas pipeline to state property. “We already have, or will have shortly, pipe running past a number of state buildings in Augusta and can guarantee we will be able to deliver natural gas to them before this year’s heating season,” said Dan Hucko, spokesman for Iberdola USA. “Maine Natural Gas was ready to build a pipeline to Augusta and deliver natural gas to state facilities in 2011.” He said that now the piple is built, the company can guarantee natural gas delivery service to state property by Nov. 1. The state’s request notes proposals to provide gas to four of its highest fuel-burning property should be able to connect to them by Nov. 1, so they can burn gas this coming heating season. Targetted property includes the former Augusta Mental Health Institute power house on Blossom Lane, to heat the state’s east side campus; Cross Office Building, west campus, off Sewall Street; Riverview Psychiatric Center, Arsenal Street and; Department of Health & Human Services, State Street on the west campus. Summit officials said they’ll likely submit proposals to supply gas to all 30 sites for which the state seeks gas service. Both Hucko and Duguay said they are confident the state’s bidding process will be fair and clear, this time. 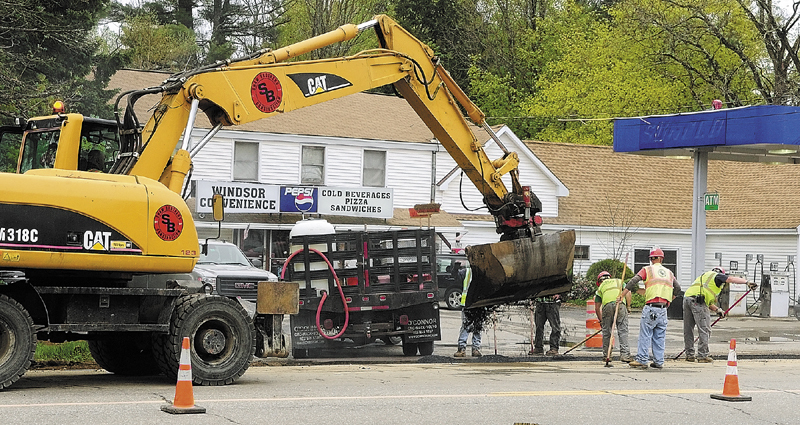 Maine Natural Gas is wrapping up its installation of pipe in Augusta, while Summit is laying pipe in communities throughout the Kennebec Valley. Heidrich said the state estimates annual savings from converting state property in the Augusta area covered by the RFP to be about $700,000. Woodcock said the cost of converting some of the larger state buildings to gas could be paid back by savings from the switch within the first year. One area the state’s previous bid process was deemed flawed by officials was a convoluted scoring system that sought to award points for price, economic impact and ability and experience in determining which company got the work. This time around, the scoring system of the 23-page RFP is much simpler. If a bidder is determined to be qualified to do the work, the lowest price wins. Different companies can be selected to provide gas to different buildings. The 10-year contract will be for providing a distribution system for natural gas. Contracts to supply the gas will be awarded in future procurements, bid documents state. Bids are due, and will be opened by the state, Sept. 3.